While the British capital has developed into a sprawling metropolis covering more than 600 square miles, the original City of London represents its very tiny beating heart. Nicknamed the ‘Square Mile’ in recognition of the modest 1.12 square miles it actually covers, the City (with the all-important capital C) was founded in the first century AD on the northern bank of the Thames in the aftermath of the Roman invasion. Proud of their strategic settlement on a kink in the River Thames, the Romans duly set about circling the fledgling City with over two miles of Kentish ragstone walls. While exposed stretches of this wall, from Tower Hill to St Alphege, can still be seen today, it is the buildings that sprung up deep within the heart of the City that reveal the true character and history of the area. Begin a circuit of the City of London at Bank underground station to emerge at street level at one of England’s grandest and most architecturally rich junctions. As three main thoroughfares intersect in a blur of black taxis and red buses, you can pause to admire a regal trio of buildings: the Bank of England, Mansion House and the Royal Exchange. While the latter has housed a popular shopping mall for centuries and the Bank (often nicknamed ‘The Old Lady of Threadneedle Street’ after the ghost said to haunt the gardens) has been the hub of the financial district since 1734, it is Mansion House that is perhaps the most fascinating of the three. Work on this Grade I listed Palladian masterpiece began in 1739 after it was decided that the Lord Mayor of London (a ceremonial role that is not to be confused with the elected Mayor of London, Sadiq Khan) needed a grander residence in which to entertain cabinet ministers, visiting heads of government and other prominent figures. Aside from the six imposing Corinthian columns that adorn the Portland stone façade and the gold-and-white Egyptian Hall, the most impressive feature of Mansion House is the art collection contained inside. This includes the Harold Samuel Collection of Dutch and Flemish Golden Age paintings that were bequeathed to the City of London 30 years ago. Although not permanently open to the public, tours of Mansion House take place every Tuesday at 2pm and allow the chance to admire the masterpieces up close. From here, saunter along Princes Street and turn left into Gresham Street to explore the ceremonial heart of the City of London at Guildhall Yard. The architectural riches span the centuries here, from the late Anglo-Saxon-era East and West crypts and the Victorian Gothic library and print room, to the 15th-century Guildhall itself – the only secular stone structure in the City to have survived both the Blitz and the 1666 Great Fire of London. In the basement of the Guildhall Art Gallery, you can even see the remains of a Roman amphitheatre that dates back to 70AD yet was only rediscovered in the late 1980s – in fact, the dark stone curve in the yard upstairs traces the edge of the original amphitheatre and gives an idea of the sheer scale. Also bordering the Guildhall is St Lawrence Jewry, a 12th-century church entirely rebuilt by Sir Christopher Wren following the Great Fire. The official place of worship for the Mayor of London, it was described by the late Poet Laureate and architecture critic Sir John Betjeman as “very splendid” – high praise, indeed. At the end of Gresham Street, turn right for the Museum of London, the perfect place to delve into local history as nine free galleries chart the development of the City from 450,000 BC to the present day. Collection highlights include the 3rd-century Bucklersbury Mosaic rescued wholesale from Queen Victoria Street, Oliver Cromwell’s death mask (cast from the Lord Protector’s face after he died in 1658), an elegantly decorated 1928 Art Deco lift from Selfridges department store and Thomas Heatherwick’s dramatic copper cauldron, the star of the London 2012 Olympic opening and closing ceremonies. Just behind the Museum of London lies the oldest hospital in Britain, St Bartholomew’s, which was founded in 1123 by Rahere, a former courtier of King Henry I who vowed to open the hospital after falling ill during a pilgrimage to Rome. While the hospital is still caring for patients today, the Hospital Museum in the north wing displays choice items from the archives including an original grant document from 1137 and two epic biblical paintings by William Hogarth that previously adorned the hospital’s grand staircase in the 18th century. As you exit the hospital, look out for Postman’s Park, a tranquil green space just off Little Britain (a famous bit of London trivia has it that there are no roads in the City of London, only “streets”, “alleys” and other fantastically named thoroughfares such as this, but in fact this is no longer strictly true – when the Golden Lane Estate was absorbed into the City in 1994, half of Goswell Road now falls within its boundaries). The park is notable for a 1900 memorial conceived by the artist GF Watts that commemorates “everyday” heroes who have lost their lives trying to save others. Ceramic plaques dedicated to such acts of self-sacrificing bravery have been added for more than a century. Walk down King Edward Street from the Postman’s Park and you can’t fail to miss Sir Christopher Wren’s masterpiece, St Paul’s Cathedral. Built in 1697 and London’s tallest building until 50 years ago, it has played host to some of Britain’s most significant events, from the wedding of Prince Charles and Lady Diana and the jubilees of Queens Victoria and Elizabeth II, to the funerals of Winston Churchill, Margaret Thatcher and Lord Nelson. Non-worshipping visitors are free to explore the grand vaulting interiors, and a visit to the Whispering Gallery under the dome is highly recommended – the acoustics here are such that even a whisper on one side can be heard on the far side of the span. Wren was tasked with designing St Paul’s after the old church on the site was gutted during the Great Fire of London in 1666. At the other end of Cannon Street, the architect also constructed The Monument, a 61-metre Doric column that pays tribute to that great disaster via a flaming copper urn on top. If you can stomach the 311-step spiral staircase climb to the top, the big reveal from the viewing platform is suitably breathtaking. The Monument would provide a suitably reflective spot to end a brisk walking tour of the City, yet one can bring history up to the present with a final visit to the nearby “Gherkin”, or 30 St Mary Axe (named for a medieval church that stood on the site until the mid-16th century). 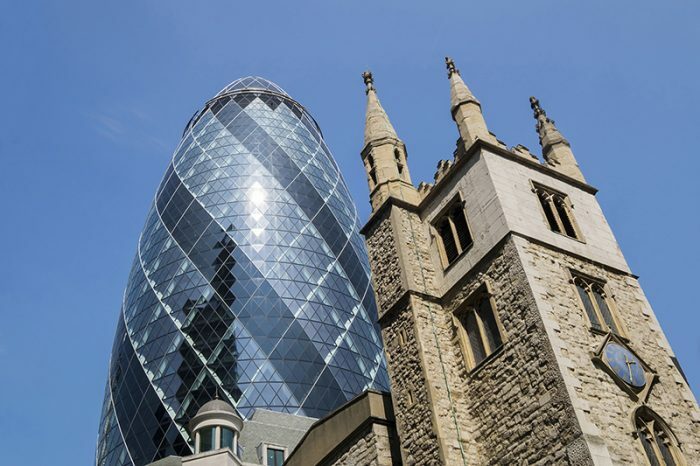 Designed by Norman Foster and built on the site of two former shipping exchanges, the Gherkin has become one of the London skyline’s most popular additions in the 13 years since it opened. So while the majority of the building is filled with commercial businesses, head to the Gherkin Sky Bar on the 40th floor to enjoy a cocktail with a 360-degree view of the City and a glass dome roof, ideal for cloud watchers and stargazers alike.